When it comes to food for delivery, Pizza Hut has been one of our family's most-trusted provider. Just check out my wide collection of posts under the pizza hut tag. And take note, none of them were even sponsored! That's how crazy for Pizza Hut my family is. Upon first bite, I already got hooked! My lil sis who loves cheesy pizzas as much as I do, loved this to bits as well. We even fight for the slice with the most balls of cream cheese! Haha! Of course, this is best eaten warm. But if you're like me who hoards and savors everything slowly, you can always pop them in the microwave. They'd still taste amazing! To enjoy your very own serving of Pizza Hut's Cheesy 7, just add P40 (regular) or P65 (family) for dine-in to upgrade your supreme line pizza to Cheesy 7 pizza with Pizza Hut's Big Group Feasts. If like us, you prefer to have it delivered, you can order a la carte or go for the new Dewberry Group Feast which includes a family size Cheesy 7, 2 orders of Spaghetti Bolognese, a box of 4-piece WingStreet, 1 liter of Tropicana Twister Mango Juice Drink, and 4 pieces Dewberry cookies for only P699. If you love pizza and cheese, then you definitely don't want to miss this! Facebook Page or follow them on Twitter. For deliveries within Metro Manila, dial 911-1111.
ohh i wanna try this new pizza from Pizza hut. I love cheese too! I think the package price of P699 is a good deal. 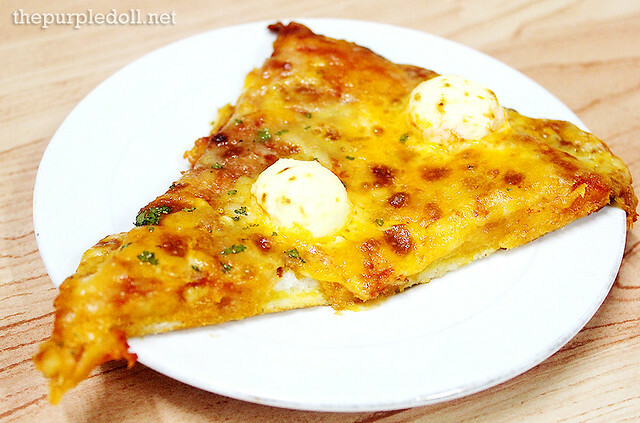 Must try this soon..
We stopped ordering for delivery from Pizza Hut but this Cheezy 7 Pizza might change my mind. I will be ordering this next time! I've always loved this particular pizza from their menu! !